Boruto and Sarada confirm Juugo’s appearance. However, Juugo is under the influence of a ‘Cursed Seal’, and has transformed into a ferocious monster. The ‘Cursed Seal’ is one of Orochimaru’s research materials. Even though it amplifies strength and stimulates that attack instincts of living beings, Juugo is someone who possessed that capability from birth. 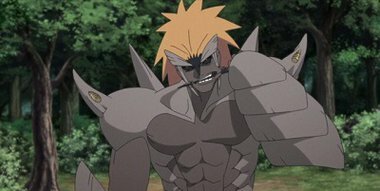 Juugo has lost control over himself and begins to attack, putting up a difficult fight against Boruto and his comrades. Even though he’ll be getting assistance from his friends, will they cause damage to Juugo somehow? !